Pioneer LX01 review | What Hi-Fi? Summing up Pioneer's LX01 is easy: it's by some way the best home cinema-in -a-box system in the world. For example, it's able to decode HD audio formats such as Dolby Digital Plus, Dolby TrueHD and DTS-HD Master Audio. 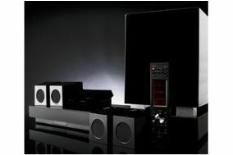 So, plug in a suitable HD source – such as Pioneer's own BDP-LX70A Blu-ray deck – and you'll be treated to surround audio far superior to anything else previously unleashed on the all-in-one-box market. But wait – there's much more. As befits its glossy black finish, the LX01 is designed to be stealthy; its four compact ‘Omni-Surround' speakers are tiny – just 9cm high – and there's no centre speaker. Instead, the centre-channel sound is generated using two dedicated drivers on each angled face of the two front speakers. Place these either side of the screen and fairly close to it, and you'll get enough of a sonic ‘lock' to make dialogue believable. Amplification is in the sub, which boasts two downward-firing drivers and a claimed 400w of power. It also has three HDMI inputs and one output, as well as control cabling to link to the system's final elements – a central, DVD-sized ‘hub' and separate display. The hub's stark appearance belies its sophistication. It houses USB inputs for audio devices and PCs, a DV-in for a digital camera, an RDS tuner and a DVD recorder, plus a 250GB hard disk. This can store video from either analogue or Freeview tuners (upscaled to 1080p as necessary), plus audio, delivered either from CDs or, via USB, from MP3 players or PCs. Arranging and accessing music is made easier by the Gracenote compact disc database, for automatic track titling. Control comes courtesy of a classy remote handset with a touchscreen LCD panel, plus a separate display unit linked via a long umbilical to the hub. This can be mounted on a wall or table – as you prefer – and has connections for iPods and standard MP3 players. Of course, all this sophistication would be for naught if the Pioneer didn't deliver performance to match its promise, but the LX01 even manages to excel here. Picture performance is terrific from both the DVD player and hard-disk recorder: edges are crisply drawn, motion handled with assuredness and background noise kept to a minimum. Movie sound, meanwhile, is superbly well integrated: Pioneer's sophisticated automatic calibration and equalization helps fine-tune the delicate balancing act between speakers and subwoofer. As a result, when asked to deliver DTS-HD action from Master and Commander, the LX01 produces a refined and powerful presentation. It has genuine punch and drive, while its ‘invisible' centre channel is surprisingly convincing and impressively clear. The LX01's one weakness is that it's too recessed in the midrange to deliver truly satisfying hi-fi sound. It's not harsh or lumpen, though, which will do for us, given its other capabilities. But while better sound could be achieved by opting for separates, this would be at the cost of the very quality that draws many people to all-in-one systems – compact style. And the LX01 plays the stylish card with only the barest hint of a compromise. It really is some system.